After being sold and then closed by the City, Barbara Ann's is back up and running. I stopped in for lunch last week and found that virtually nothing has changed except for the folks behind the counter. 7617 S Cottage Grove Av. That is one hell of a photo, JSM. Your posts, at least, would generally suggest that you do not get enough fiber. and the woman behind the counter, both are old hands from the glory days. to have misplaced it and so cannot tell you what it is. I will say, based on 3 trips now, that isnt *quite* the same as it was with Mack. and spaced it out more, I dont know. non-busy times and thus not gotten the perfectly freshly done links yet. I'm not ready to declare that all is right with BA's, if only because Mack was always such a key player. Did they always offer "beef rib tips," as now advertised in the window? I just stopped for a quick combo and never gave the phone number on the menu a second thought! The number I included on my original post came up on Google, have you tried calling it? Hopefully this snafu is not interfering with your room service orders. The new number for Barbara Ann's BBQ is 773-651-5300. I tried calling the old number, and had to resort to the same trick of calling the Motel for the new number. I found myself in the vicinity today about 11:45 am and so toddled on over to Barbara Ann's. First time ever. Hope it won't be the last--though it's hardly convenient to home. 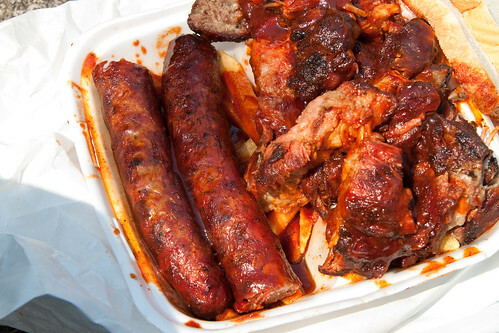 Got the rib tip/hot link combo (hot, not mild) for $9. My oh my. Oh my. Oh. In the words of someone or other, this is some seriously good eats and, on reflection, worth bumping this thread for. It's hard to believe nothing has been posted in three years. For those of you who have never been, get you hence. Pronto. Took some out of town relatives on a tour of the south side and stopped for a tailgate lunch of tips,links and chicken at Barbara Ann's last month. Phenomenal as always ! I manage to make it to BA's at least twice a year and have never been dissapointed. Gypsy Boy wrote: My oh my. Oh my. Oh. In the words of someone or other, this is some seriously good eats and, on reflection, worth bumping this thread for. I hear ya.......though I have a fondness and loyalty for Mack, the Adams and my WSM, I need to get back here soon. Thanks for putting it back on my radar, I mean GPS. Gypsy Boy wrote: My oh my. Oh my. Oh. In the words of someone or other, this is some seriously good eats and, on reflection, worth bumping this thread for. It's hard to believe nothing has been posted in three years. Its been way too long since I've been to Barbara Ann's, an oversight on my part which I intend to rectify in short order. Tried BA's for the first time last week. I ordered a tip/link combo (well done, sauce on side, natch), and at <$10 with tax this is one of the best BBQ deals around. You'd be hard-pressed to find this much food for less than $25 on the North side. Links were cartoon-sized with a great snap and a noticeable heat, ground coarsely with large chunks of fat visible. Tips were plentiful, with tough exteriors with a strong smoke flavor. Though neither needed sauce IMO, the hot & mild sauces were both exceptional. I wish I'd read the tip on combining the two, as I think the hot might have stretched me to my limit. Combo came with a few slices of wheat(!) bread. Another great rec from LTH. One of the best BBQ joints (in my limited experience) I've been to anywhere. geno55 wrote: Links were cartoon-sized with a great snap and a noticeable heat, ground coarsely with large chunks of fat visible. Tips were plentiful, with tough exteriors with a strong smoke flavor. Though neither needed sauce IMO, the hot & mild sauces were both exceptional. I wish I'd read the tip on combining the two, as I think the hot might have stretched me to my limit. Combo came with a few slices of wheat(!) bread. Totally agree. I call the tips "sauropod-sized" (thinking of Fred Flintstone and the dino-ribs), and the links "Ed Fisheriffic." Ninja cat is BOLD! Damn. You gotta keep a squirt gun around for that. hey geno55 what all is in the box ? 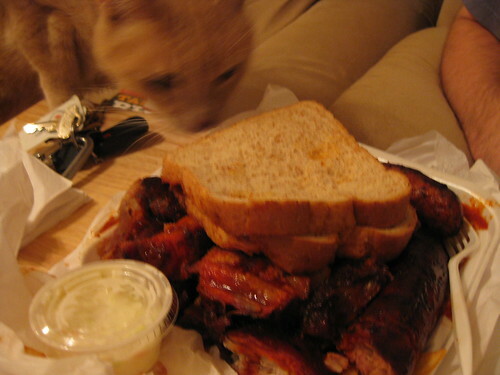 ribs , tips ?& is that wheat breead! No sight of wheat bread at Barbara Ann's last week, just great barbecue with even more wonderful campfire smoke than usual. Ribs were perfection, tips slightly dry but forgivable for the tenderness that level of done-ness brought to the normally squeaky cartilage meat, and the caramelization of the exterior. Links are my second favorite in the city, and a necessity at the moment since, as noted for several weeks, Uncle John's schedule has been inscrutable of late. Santander wrote: No sight of wheat bread at Barbara Ann's last week, just great barbecue with even more wonderful campfire smoke than usual. ... Uncle John's schedule has been inscrutable of late. The Bride and I spent last weekend in the city, planning to finally visit Uncle John's, only to discover Mack has closed for March . Barbara Ann's was a good fallback, tho the Bride declined to stay at BA's motel, despite my insistence that it offered great value. No ribs, no chicken at 7p on a Friday, but the tips and hot links were good (tips also a bit on the dry side, but nice smoke and chew, hot links excellent), and the bread was, surprisingly, wheat bread. All in all, a fine kickoff to a meaty weekend (BA's followed by Birria tatemada and 5 Guys burgers). Santander wrote: . Links are my second favorite in the city, and a necessity at the moment since, as noted for several weeks, Uncle John's schedule has been inscrutable of late. Its not actually inscrutability - as mentioned elsewhere, UJ's is closed for a month. Mack is off holidaying in Arkansas for a couple of weeks, and that will apparently be followed by a couple of weeks worth of remodelling of UJ's (though no seating is planned, or so I was told when I asked the last time I as there, the day before they went on break). In general the timings are UJ are fairly ok, usually... its supposed to close at 10pm nowadays (a couple of years ago it used to be 11pm - and before that it was even 1am on weekends - but no longer).. Ive sometimes seen them shut down 10 minutes early if there werent any customers, but in general theyre pretty good with sticking to their timings. (Ive been there at 9:45 pm a couple of times, for instance, and they were still going strong). Havent been to BA's in a while - have been doing UJ's as my default for ages now. BA's was still just fine the last time I went, of course - their links are still 2nd only to UJ's for me. Iam sure I'll end up there before the month is out. May you have scruted correctly. As part of a pre-birthday Saturday of calorie-positive cycling, I went to Barbara Ann's for the first time. The tips were good, though not worth the ride on their own. The links, however, were in a totally different league - blowing away all hotlinks I've had before (I've yet to make it to UJ's...). Super coarse definition, smoky, herby, with a solid dose of heat. If I lived any closer (it's a 20mi bike ride each way), they'd be in my regular rotation. The one downside of riding down there is no trunk to eat on, so my dining companion and I sat on the curb and munched away. As an aside, the folks running the place couldn't have been nicer. The woman running the show was the nicest lady I've ever been separated by bullet-proof glass from. Do any of you have any information as to if/when Barbara Ann's will reopen? How extensive was the fire damage? c_howitt_fealz wrote: Do any of you have any information as to if/when Barbara Ann's will reopen? How extensive was the fire damage? I passed it a few weeks ago on a Saturday, it was shut with no hint it may reopen. I didn't notice any fire damage, though I wasn't looking for any. The cashier at Lem's told me about the fire. I see a tweet from Pigmon from June- but can't seem to find anything else. c_howitt_fealz wrote: The cashier at Lem's told me about the fire. I see a tweet from Pigmon from June- but can't seem to find anything else. Barbara Ann's has been closed for many months, approaching a year I think. I had no solid information, so never posted before. Passing by numerous times since last spring, it always looks the same. Mysteriously, several Yelp reports have appeared since last summer. I suspect they're either fabricated or delayed postings. Someone at Barbara Ann's Motel told me there are plans to reopen the Bar-B-Que but couldn't say when. dicksond wrote: Barbara Ann's was a good fallback, tho the Bride declined to stay at BA's motel, despite my insistence that it offered great value. It may take more than a promise of great value to lure someone there. Here are the first two sentences from the first and only Yelp review of Barbara Ann's Motel (it gets one star). Latonya C wrote: Ok, you got you a young hot guy that wants to give you all the meat he's got to offer. So you go somewhere not far, not too expensive, get you a drink and some lime aid and wind up in a dump like this. I was there on March 13, 2012. I know that date is correct because I was delivering their GNR certificate and picked up a mess of links and tips for a comparison with Uncle John's--and brought samples of same for the Small Household Food Exchange group that met that evening at Sunshine Cafe. No idea when they closed but Rene G's "coming up on a year" sounds like a distinct possibility. So we're not talking about hot links anymore, yes? I believe I have one slightly more recent data point: I picked up a pan of links for a party with some classmates at Promontory Point over the past summer (June 2012, sometime around then), not that that is much consolation. When it was on, it was as good as UJ's or Lem's.